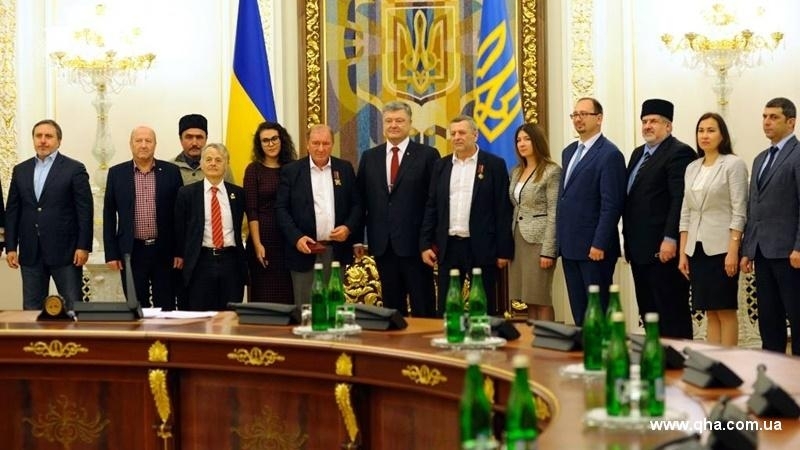 President of Ukraine Petro Poroshenko awarded the Orders of Merit to Deputy Chairmen of Mejlis of the Crimean Tatar people Ilmi Umerov and Akhtem Chiygoz, the QHA correspondent reported. It is noted that Umerov received the Order of Merit of the Second Degree, and Chiygoz got the Order of Merit of the Third Degree. Earlier QHA reported that on October 25, former political prisoners of the Kremlin, Akhtem Chiygoz and Ilmi Umerov, previously convicted in the occupied Crimea, were transferred to Turkey, after which they returned to Ukraine. The arrival of Chyigoz and Umerov in Kyiv was planned on October 26, but it was postponed to October 27. On October 27 Umerov and Chiyhoz arrived in Ukraine. At the international airport "Boryspil" they were met by the Head of Mejlis of the Crimean Tatar people Refat Chubarov and the Representative of the Presidential Commissioner of Ukraine for Crimean Tatar people Mustafa Dzhemilev. At the airport, Chiygoz and Umerov gave a press conference.